With apologies for the delay, which was due to a technical hitch! The audience asked so many questions that we over-ran our allotted time with questions. So, rest assured, this talk was worth waiting for. Eleanor has a long-standing interest in Victorian furniture. After visiting an exhibition at the the Victoria and Albert Museum and seeing the classical story of the Judgement of Paris depicted in inlaid panels, she nows explores which stories the Victorians tell in furniture and why they might choose to do so. There is no slideshow due to copyright restrictions on the images used, but the Juno cabinet by Bruce J. Talbert may be viewed online courtesy of the Victoria and Albert Museum. References to images shown are included in Classics and Victorian Design – list of illustrations. 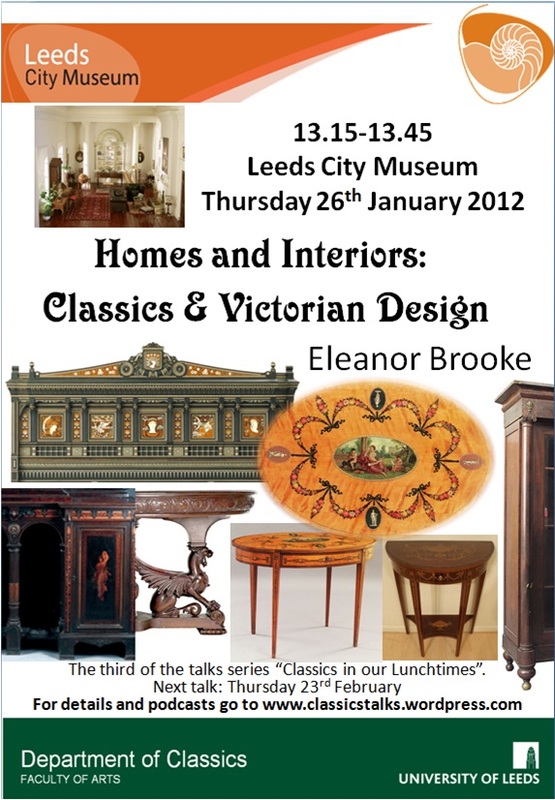 Find the rest of the “Classics in our Lunchtimes” talks series on the Museum Talks page.